this work is a plaintive cry for God’s guidance amidst the din and distractions of our world. 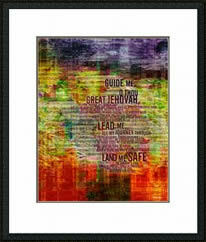 The canvas of “Guide Me” continues a signature motif of my work: the “working” side of the tapestry our lives have woven, which to us appear random and mottled, but the Lord sees completed on the "finished" side. This unframed 16"×20" print is designed to fit in a standard 20"×24" mat with a 15½"×19½" window. Note: A standard size mat will overlap the image by about ¼" all around and will cover the artist’s signature, work title, edition number, and embossed studio hallmark.